Learn to how to keep your horse flexible and supple; more comfortable and able to perform better. 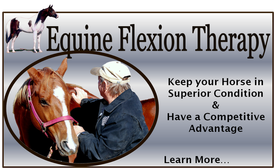 Through the Equine Flexion Therapy Clinic, Dan Marcum will teach you how to self access your horse, pin point problem areas, and perform flexion and massage techniques. Instructor Dan Marcum of Kirbyville, Texas will teach you how to perform the methods and techniques of Equine Flexion Therapy. His instruction will enable you to correctly access any horse, and provide a valuable service to any horse owner. This knowledge also provides an avenue for increasing your income, and gaining more exposure throughout the equine industry. Each participant will receive the Equine Flexion Therapy instructional book, authored by Dan Marcum, the opportunity to receive discount prices of all Dan Marcum's D-Stressor tools, and followup services to help you execute the training you received from the program.